Barrie, Ontario, August 13, LinkGreen is pleased to announce the launch and completion of an integration with RenoWare. 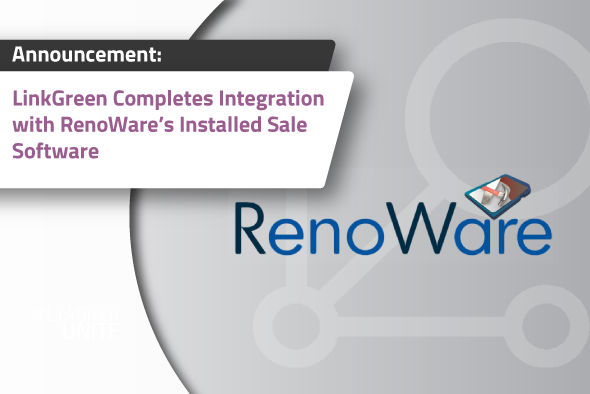 This integration with RenoWare’s installed sales software provides supply vendor catalog data to RenoWare and their users during the quoting process. RenoWare provides software that is designed specifically for home improvement, lawn & garden, and specialty centres to better manage the design, estimating and installation process. Integrated with a number of point of sales systems and used by leading building centres in Canada, RenoWare is a leader in installed sales technology. This data exchange through LinkGreen enables building centres like Home Hardware, Timber Mart and Castle to access current vendor catalog data, including product images and cost during the quoting process. “We are pleased to offer RenoWare users access to a visual interface to explore products and easily add current product description, images and cost to quotes.” commented Warren Patterson, CEO of LinkGreen. This partnership offers all types of retailers efficiencies and opportunities to provide their customers with a better selection of products for their projects. As well, integration provides employees with a streamlined quoting, ordering and administrative process. LinkGreen continues to partner with technology companies to offer a simplified supply chain.